Bats are in their own Order, called Chiroptera, meaning "hand-wing." This is due to their unique flight abilities with wing bones that are similar to those in human fingers. Keen's myotis is a medium-sized (wingspan 21–26 cm) insectivorous bat with dark silky brown fur and indistinct dark shoulder spots on the back. Their ear and flight membrane is dark, but not black. The ears are long enough to extend at least 4 mm beyond the tip of the nose when pressed forward. The tragus is long, upward pointing, and tapered at the end, in contrast with the short, blunt ended tragus of the little brown bat. The tragus is a fleshy projection that covers the ear canal, the entrance of the ear. (People have a tragus, too, but it doesn't play a role in echolocating as it does in bats). Because each species of bat has a different shaped tragus, this is a good way to identify them. The outside edge of the tail membrane has a fringe of tiny hairs, visible with a hand lens. Keen's myotis averages 9 cm in length and 8 grams in weight. Because of the relatively low number of M. keenii that have been captured in the wild, little information is known about their lifespan, but they have been documented to live up to 13 years. Studies have shown that M. keenii prefer to roost in Cedar and Hemlock trees that have various degrees of decay and defects. Little is known about the breeding habits of Keen's myotis. Limited evidence suggests that M. keenii mates in autumn and gives birth to a litter of one the following June or July. Warm roost sites with stable microclimates are selected by females for day-roosting in temperate climates, which likely reduces the demands of thermoregulation. This assists reproductive females in fetal development and growth of juveniles by allowing reproductive females to avoid or reduce the use of torpor. Bats often enter torpor during inclement weather to conserve energy, but this delays juvenile and fetal development and inhibit milk production. Females provide milk and protection to their young until they become independent, usually by late August. Torpor occurs when M. keenii enters a decreased state of physiological activity by reducing their rate of metabolism and body temperature. Torpor can occur daily during winter months. Very little is known about this species. They are believed to be solitary and reported to fly rather slowly while foraging. Being nocturnal animals, bats sleep during the day and hunt and feed during the night on caddis flies, mayflies, leafhoppers, beetles, moths, lacewings, and spiders. The short duration of darkness during summer nights at high latitudes reduces foraging opportunities, thereby limiting the northern range of bats. M. keenii captures both flying prey in the air and by gleaning prey from surfaces. Studies have shown about half the M. keenii's diet to consist of spiders, suggesting that this species is actively selecting their prey by gleaning rather than opportunistically hunting. Migration for M. keenii occurs between summer maternity colonies/foraging areas and hibernacula (where bats hibernate). 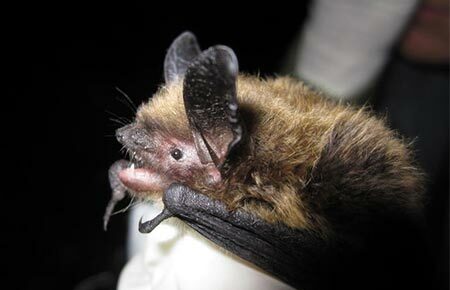 Distributional range suggests Keen's myotis is associated with coastal forest habitat. They are also associated with mature forests. Southeastern Alaska's temperate rainforests contain abundant live trees and snags in a variety of sizes. 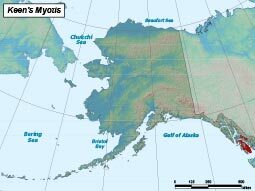 Such structural diversity provides loose bark and tree hollows suitable for cavity roosting bats, suggesting that the temperate rainforests of southeastern Alaska provide structure required by M. keenii and other bat species. Caves and crevices are also important habitat for this species, and over 1,769 km² of cave and crevice-containing karst occurs throughout southeastern Alaska. Myotis keenii has one of the most restricted distributions of any North American bat. Statewide trends in population numbers are unknown, but presumably is at least several thousand. A maternity colony in British Columbia included about 40 reproductive females. The distribution of M. keenii is associated with coastal rainforests in the Pacific Northwest. Forty-two percent of the most productive forests in southeastern Alaska were harvested by 1990, including over 70% of the karstland forests on Prince of Wales and neighboring islands. Current levels of timber harvest could have a detrimental effect on the Alaska population by altering forest structure important to bats. Bat activity is rare in clearcuts and second-growth forests of Southeast Alaska. Destruction of karst by recreationalists or mineral extraction may be a threat, as these areas are critical hibernacula. There are no documented predators of this species. It is likely the same animals that prey upon the little brown bat also take Keen's myotis, such as owls, hawks, cats, or raccoons. Only one litter, usually of a single pup, is produced per year.